I found this story about a football player who was cut from the Detroit Lions at the beginning of this football season. The Lions are a team who would go on to lose every game this year and finish 0-16, something no other team had ever done. Within a week he signed a contract with the Pittsburgh Steelers and is now a Super Bowl Champion. Sean McHugh had just survived final cut day with the Detroit Lions, meaning he was all but assured another year in professional football. He hoped to start at fullback and would play for the league minimum – about $520,000 for his experience level. But just before the first practice in September, he was summoned to the office of team president Matt Millen. He knew the drill. He was released. Three days later he was signed with the Pittsburgh Steelers for the season. He’s been mostly a reserve fullback, making the most of his chances, doing the dirty work of blocking. He’s marveled at the culture of success that the Steelers organization has established. The Pittsburgh Steelers foster a CULTURE OF SUCCESS. During these challenging times we have to remember that we also have a lot of success, experience and talented people to be proud of. We can’t lose sight of our own culture of success, and be sure we’re pushing forward and making positive things happen every day. Good things will happen for people who work hard. We are an industry leader, one of the best at what we do. We should always remember that. Where do you begin? You’re engaged and starting to plan your wedding and it’s challenging, because there are so many things to think about. How do you translate all of your inspired wedding ideas into a manageable course of action? 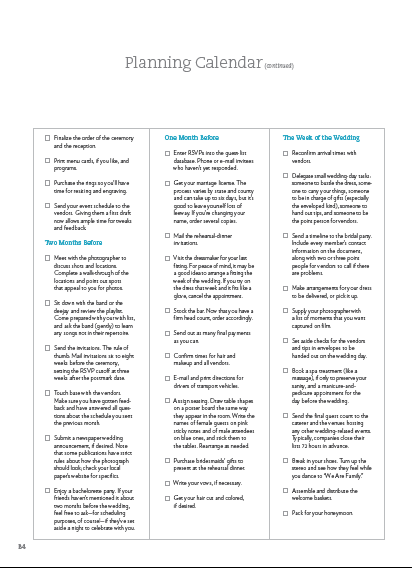 Start by downloading our comprehensive checklist that is sorted and categorized based on the 16-month length of the average engagement. Collect your fabulous ideas. Search the internet, wedding magazines and ask all of your married friends for fun wedding ideas. This is the fun part – make your wedding day everything you’ve ever dreamed it would be. Choose your date and book your venue first. Sometimes the availability of your church or your pastor will challenge you to shift your wedding date around a bit. If you’re reception will be held at a different location than your wedding ceremony (like having your ceremony at your church and your reception at a hotel or banquet room), finding a date when BOTH locations are available may also be a challenge. Start planning early and lock in your date as soon as possible. Some vendors can only make one commitment per day. Some wedding vendors can serve a bunch of different couples on the same day. Think about your florist, your bakery, party favors, cookies, cupcakes, these vendors typically handle more than one wedding per day. On the other hand, your photographer, band, wedding planner and most caterers can only be in one place at a time – so book these vendors early. Get the Wedding Planning Calendar Now. It’s loaded with a bunch of things to considered, and some things you might not of even thought of yet – and I’m passing it along to you for FREE. 8 Questions to ask your wedding professionals. How to tastefully use social media at your wedding. Use these tips to help you get started planning your own wedding day.